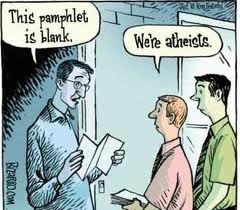 I think a scary number of religious people would forcibly convert atheists or dominate them in some other way. I was a Christian when I was a kid, but as I got older, doubt began to take hold. There is NOTHING anyone could SAY to get me to believe. A psycho mind event (that part of your brain that makes you 'perceive' spirits) could get activated, but even personal loss didn't budge me toward belief. I talk about it openly with my two older kids, but my youngest, almost 7, loves God, like Santa and the Easter Bunny. Slowly, I'm explaining the differences that exist in worldviews but I don't come out and say "We're ATHEISTS" out of concern the article reflected. It is frustrating that not believing in something can alienate you from other people so much. Of all the things that define me as a person, being an atheist is probably the most insignificant one. However, everyone else ignores all the other good qualities about atheists and just focuses on the fact that they don't believe something.